Vast Exploration Inc. Under the Spotlight! 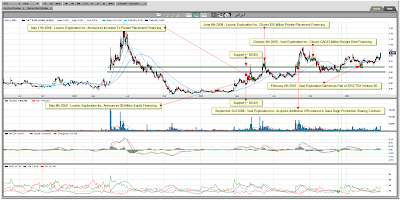 Last Friday Vast Exploration broke out above $0.80. I forgot to put that level on the map but it indeed was a level of resistance which is now broken through on heavy volume! Last Fridays trading saw over 3.2 million shares changing hands. To find that kind of volume we need to go back in time to September 2009 when Vast Exploration announced it had acquired a 10% Interest in the Qara Dagh production sharing contract. Needless to say, interest is definitely there cause else there would have been no momentum to get through that resistance level. So Mr.Market wants Vast to break the $0.80 resistance level and wants Vast to find support there next time it hits that same $0.80? I suppose so. Next days trading will have to confirm the $0.80 as support from which to build and go for the other earlier high which was in the $0.90-ties. Vast Exploration has been on my radar for a little while now and just one week ago I decided to add Vast Exploration to my private group on stockhouse cause I felt it had the potential to do well. Now that the first confirmation has been delivered to us it is now time to wait for a confirmation of finding support above the $0.80 level. Lastly some more information on Vast. Now I know, they have their operations in Iraq but they are based in Kurdistan which is considered the safer place to be when it comes to Iraq. Just saying, take your time to do due diligence on Vast Exploration. I for one have weighed the pro’s and cons and for $0.80 with all that potential which has yet to be explored I’m just willing to make a little wager that’s all. That does not mean that you need to make that wager also. As of yet I have no vested interest in Vast Exploration Inc. seeing as I am no share holder but I am highly considering becoming one. The Qara Dagh Block lies on trend with existing discoveries and is located in the prolific Zagros Fold Belt of Northern Iraq which contains several large fields including the super-giant Kirkuk field. To view the Qara Dagh Block location please click the following link Kurdistan License Map. To view the surrounding discovered fields and regional infrastructure please click the following link Iraq Petroleum Map. For further information on the Kurdistan Regional Government please visit www.krg.org. Vast Exploration Inc. currently has production operations in the Boyer area of the Province of Alberta, Canada. The company is publicly listed on the TSX Venture Exchange under the symbol “VST”. Vast Exploration has a 37% interest in the Qara Dagh Block. The Company obtained a 27% interest pursuant to a production sharing contract signed in 2008 with the Kurdistan Regional Government and holds an additional 10% interest in the Qara Dagh block subject to the issue of 60,000,000 Vast common shares in accordance with the directions of the Kurdistan Regional Government. A 354 kilometer 2D seismic program was completed in June 2009 and plans have been finalized to spud the first exploration well in March 2010. The block covers 846 square kilometers and has a large linear surface anticline, which is on a similar trend as the existing oil fields in northern Iraq and the more recent discoveries in Kurdistan at TaqTaq and Miran. Data processing and interpretations have been completed and integrated with regional and surface geological models. Three main prospects, which correspond to the three domes on the surface structure, have been confirmed by seismic mapping. The Qara Dagh Block is located in the prolific Zagros foldbelt which extends from southern Turkey across northern Iraq and into southwest Iran. Large anticlinal structures, which formed during collision and formation of the Zagros Mountains, contain giant and supergiant accumulations of oil. The large surface structure on the block is known as Qara Dagh Mountain (“Black Mountain” in Kurdish) and is a prominent anticline which rises as high as 600 meters above adjacent valley floors. This 65 kilometer by 5 kilometer feature has steeply dipping limbs and an exhumed central valley which exposes progressively older stratigraphy towards the anticlinal core. The Eocene and Paleocene Pila Spi, Gercus and Sinjar formations of lower Tertiary age extend along the interior slopes of the mountain and the central valley is covered by the Paleocene Kolosh shale. The subsurface structure is characterized by a large thrust fault, which extends along the length of the southern limb of the surface anticline, and a large fault bend fold in the overthrust section which is comprised of Cretaceous, Jurassic and Triassic strata. There has been no prior oil exploration on the Qara Dagh Block and the entire Kurdish area of northern Iraq was virtually unexplored until the Kurdish Regional Government issued new exploration contracts in 2007. To the southwest, the supergiant Kirkuk Field was among the first discoveries in Iraq. Kirkuk and other major fields such as Bai Hassn, Jambur and Kor Mor produce mainly from Tertiary reservoirs; however, to the northeast these formations lose prospectivity as intense deformation has caused the Tertiary formations to be exposed on the land surface. This deformation has resulted in highly fractureds subsurface structures formed by the deeper Mesozoic formations. As a result, the main reservoirs at TaqTaq and Miran are formed by the Cretaceous Shiranish, Kometan and Qamchuqa Formations. Extrapolation from nearby oil fields, recent discoveries and the seismic interpretations indicate seven potential reservoirs on the Qara Dagh structure. Fractured carbonates in the Cretaceous Shiranish, Kometan and Qamchuqa/Balambo Formations are prospective under the Kolosh shale seal and above a rich oil source rock in the Sarmord Formation. The Jurassic Alan, Mus and Butmah Formations are sealed by upper Jurassic anhydrite and charged by the Sargelu Shale which forms a regional oil source rock. Few wells have been drilled into the Triassic; however, the Kurra Chine is productive elsewhere in Iraq and could contain oil or liquids-rich gas at Qara Dagh. The Company believes that proximity of the Qara Dagh Block to recent discoveries at TaqTaq and Miran and the presence of oil seepages on the block make the Qara Dagh structure a low risk prospect with the potential for the discovery of large oil reserves.